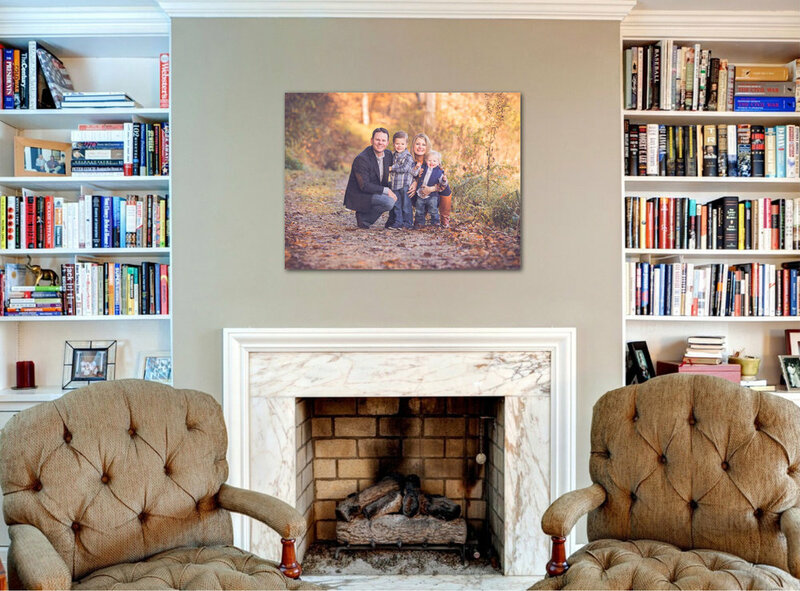 Your family is beautiful, a work of art....and that art deserves a prominent place in your home! Wouldn't you rather enjoy your photographs every day on your walls and not have to worry about finding them on your phone or Facebook, or look high and low for that CD or USB? From gallery wrapped canvases, to mounted and framed prints, to wood and metal prints, there are a variety of options to suit any home decor. Let me assist you with decorating your home! We can even do a digital wall design by taking a photo of a room in your home, and virtually hang your photos on your walls, scaled to fit. Sometimes it's hard to visualize how your photos will look on your walls, and knowing what sizes to order can be even harder. Seeing really is believing! Check out the gallery samples below to see various digital wall designs for living rooms, dining rooms, bedrooms and stairways. You might be thinking, "Well, I have a home with an open floor plan and not a lot of wall space. What else can I do to display the photos I absolutely love?" Flush Mount Albums are a fantastic option for all of those photos that you can't fit on the wall but you still can't live without. With a genuine leather cover and thick pages, these are truly a high quality item that will last for years and years. And they're not just for weddings anymore - your newborn baby or your graduating high school senior's photographs can be preserved and displayed beautifully. Even your annual family photographs are deserving of a gorgeous album that you can pass on to your children and grandchildren. For complete pricing information as well as everything you need to know about your photo session, request the Wendy Sorensen Photography Client Welcome Guide today! Send me the client guide!